Orlando is defined by its theme parks, which are arguably some of the best in the world. Orlando is the place to submerge yourself in the worlds of much-loved cartoon and film characters, from Harry Potter, to Mickey and Minnie Mouse, to Spiderman and the Hulk. You can spend your days going on thrilling rides, sliding down water chutes, swimming with dolphins, eating at fun themed restaurants and meeting your favourite characters in person! With many parks catering to your every need, providing accommodation, transport, food and entertainment, you will feel no need to leave the parks until it’s time to catch your flight home. With over a dozen theme parks in Orlando, it may be difficult to choose between them. Send My Bag is here to help with its list of the best theme parks in Orlando. Don't forget you can use Send My Bag to ship your luggage to Florida. This way you can bring everything you need to see you through a Orlando theme park visiting marathon! You can ship your luggage internationally if you are visiting Orlando from abroad, or you can ship your luggage from any state across the US. If you are moving to Orlando to work at one of the many theme parks there, you can also use Send My Bag to help you relocate, whether this is permanently or just for the peak holiday season. Get your quote now. What it’s like: Universal Studios is designed, for the most part, like a US frontier town. On the right-hand side of the park this gives way to the kid-friendly zone and a Simpsons-themed fun fair area. Head to the back of the park and you will find yourself on a London street; explore further and you will step into the magical world of Harry Potter and Diagon Alley. Prime attractions: Universal Studios is home to the second phase of the Wizarding World of Harry Potter, which opened in 2014. Diagon Alley has been reconstructed, complete with Ollivanders’ wand shop, Weasley’s Wizard Wheezes and the Leaky Cauldron. Harry Potter and the Escape from Gringotts is the main ride here ? a roller coaster that uses 3D animation and live-action film. Why it’s good for the whole family: Universal Studios has a great area for smaller kids, which includes rides that adults and older siblings can enjoy, too. If you aren’t a fan of rollercoasters, try the Woody the Woodpecker ride, which is a nice gentle one to get you started! Away from the kid zone, there are a number of fairly easy-going rides that the whole family should be fine with, including ET, Despicable Me and The Simpsons. For older, thrill-seeking members of the family there is the Hollywood Rip Ride Rockit Rollercoaster which carries you up to the sky at a 90° angle before dropping you down the other side! Location and getting there: Universal Studios is one of two parks adjoining City Walk – a strip of restaurants, bars and shops within the Universal resort. If staying at one of the Universal hotels, you can take a water taxi to City Walk, or take the garden route by foot. If arriving from outside the resort, you can park in the garage at 6000 Universal Boulevard. If hiring a car and driving from Orlando International Airport, take the SR-528 West for 11 miles, after which take the I-4 East for 2 miles and exit at 75A. You will see signs directing you to the car park or the resort hotels. If staying at Loews Portofino, Loews Royal Pacific or the Hard Rock Hotel, you will get an Express pass for rides within the parks for free (exclusions apply). You can tap into free WIFI while in the park, so it’s a good idea to download the Universal App, which provides a map of the park and indicates waiting times for each ride. What it’s like: Walk into Animal Kingdom and it will feel like you have stepped into the rainforest, as you walk past lush vegetation and an oasis. This area opens out onto a vista of Discovery Island with the enormous man-made Tree of Life at its centre, which has over 300 animals carved into its ‘bark’. This park has thrilling rides like Expedition Everest and Kali River Rapids. It also has plenty of non-ride activities, such as strolling along the numerous discovery trails featuring animal enclosures. You can also take the Kilimanjaro Safari through an African-style savannah. Prime attractions: The top attraction has got to be the Kilimanjaro Safari, which allows you to see all sorts of animals roaming freely, from giraffes, to lions, to elephants. The best ride is Expedition Everest, a rollercoaster that cranks you high up into the mountain, where you might just meet a yeti. Why it’s good for the whole family: The whole family is going to love seeing the many animals at Animal Kingdom, by either taking the safari tour, and/or strolling along the discovery trails. This park is perfect for timid younger children or adults who suffer from motion sickness. The rides are mostly very tame, but if you do decide to take on a more thrilling ride like Expedition Everest, there are plenty of areas to take a leisurely walk afterwards in order to recover! If you want to avoid rides altogether, this is the park for you as it has more alternative activities than other parks. Animal Kingdom is located within the Walt Disney World Resort, which is located in south-west Orlando. From Orlando International Airport, take the OIA South Exit to Osceola Parkway West (exit 3) to Walt Disney World Exits. Complimentary transport to and from and between the parks is on offer to customers staying at certain Walt Disney World hotels. Make use of your FastPass+ to book the Kilimanjaro Safari and the Expedition Everest ride. Do this as far in advance as you can as the FastPass+ slots can quickly run out for these attractions. To avoid queues at the main entrance, you could try an alternative entrance behind the Rainforest Café Gift Shop. If you are arriving in time for the park opening in the morning, make sure you are aware of any special early opening hours so you don’t miss out on being at the front of the queue. What it’s like: Magic Kingdom is dominated by the famous Cinderella Castle, which inspires that sense of ‘magic’ in the title. This park is the most Disneyesque, with many of the more traditional characters, like Mickey, Minnie, Goofy and Donald Duck, on parade. Magic Kingdom is divided into six themed areas: Main Street USA, Tomorrowland, Fantasyland, Frontierland, Liberty Square and Adventureland. As the most popular of the Disney parks, large crowds are mostly unavoidable. Prime attractions: Favourite attractions include the Pirates of the Caribbean and Haunted Mansion rides. These are easy-going rides for the whole family. More thrilling is Splash Mountain and Big Thunder Mountain Railroad. Rollercoaster fans must have a go on Space Mountain. The Magic Kingdom’s firework display is the best of all the parks, so make sure you stick around for it. Why it’s good for the whole family: There are aspects of the Magic Kingdom experience that will appeal to all age groups: taking the ferryboat over to the park, watching the parades and the fireworks. No matter your age, you will appreciate the vastness of the park and all it has to offer. There are many rides that all ages will like, such as the slow-moving Pirates of the Caribbean ride, or the Haunted House. There are rides designed for little kids, like Peter Pan's Flight, Adventures of Winnie the Pooh and Dumbo. And then you have more thrilling rides like Space Mountain. Location and getting there: Magic Kingdom is located within the Walt Disney World Resort, which is in south-west Orlando. From Orlando International Airport, take the OIA South Exit to Osceola Parkway West (exit 3) to Walt Disney World Exits. Complimentary transport to and from and between the parks is on offer to customers staying at certain Walt Disney World hotels. A monorail links Magic Kingdom to a number of the Disney hotels, including Grand Floridian and Polynesian Village. Magic kingdom and Epcot are also connected by Monorail. This park is best enjoyed if you do some forward planning. This way you can make the most of the park in spite of the huge crowds. Get there early to see the parades one morning, but head there before it opens another day to get a few rides under your belt early on. You are allowed three FastPasses per park, per day. Make sure you book FastPasses for popular rides well in advance as these can disappear quickly. Book your FastPasses for later in the day, but actually arrive early in the day to do the most popular rides, like Big Thunder Mountain, without FastPasses, but before queues develop. Magic Kingdom has lots of FastPass+ opportunities, so do make the most of this facility. Once you have used up your FastPasses on a particular day, you may be able to book some more, if there are any still available. Make sure you reserve a table for lunch/ dinner as restaurants fill up very quickly at mealtimes. What it’s like: Island of Adventures is an exciting park, packed full of fast thrill rides. It has one half of the Wizarding World of Harry Potter – the village of Hogsmeade, featuring the Hog’s Head pub and Hogwarts School. Other zones include Marvel Super Hero Island, Jurassic Park and Seuss Landing. Islands of Adventure is located on Universal’s City Walk which is packed full of restaurants such as the Hard Rock Café and the Toothsome Chocolate Emporium. Prime attractions: Harry Potter and the Forbidden Journey ride, located within Hogwarts Castle is a must. Other excellent Harry Potter rides include the Dragon Challenge and the tamer Flight of the Hippogriff. You must also take a walk around Hogsmeade, taste some butterbeer and purchase a wand at Ollivanders. To get to Diagon Alley in Universal Studios you should take the Hogwarts Express. Take the train back the other way, if you can, as the experience is different depending on the direction travelled. The best of the rest of the park is the Amazing Spider-Man ride, which has you flying above the streets of Manhattan and fighting off bad guys. Why it’s good for the whole family: This is a park that older kids will love, given the large number of highly thrilling rides. Younger kids are also catered for, however, particularly in the Seuss Landing area, which has the Caro-Seuss-el and One Fish, Two Fish, Red Fish, Blue Fish. Small kids will also love rides like Popeye and Bluto’s Bilge-Rat Barges water ride. Mum and Dad will appreciate the dining options, including the grotto-themed Mythos Restaurant, which has been voted best theme park restaurant six times. Location and getting there: Island of Adventures is located beside Universal Studios, off City Walk. If staying at one of the Universal hotels, you can take a water taxi to City Walk, or take the garden route by foot. If arriving from outside the resort, you can park in the garage at 6000 Universal Boulevard. If hiring a car and driving from Orlando International Airport, take the SR-528 West for 11 miles, after which take the I-4 East for 2 miles and exit at 75A. You will see signs directing you to the car park or the resort hotels. If staying at one of the Universal hotels, you can charge everything to your room and then settle the bill when you leave. If you plan to go on some of the water rides, think about bringing a poncho so you don’t need to fork out for one at a Universal shop. What it’s like: Epcot is built around a large lake and has two distinct sections. Running round most of the circumference of the lake is the World Showcase section. This area is full of buildings that represent the quintessence of different countries, from Germany, to Norway, to China, to France. These buildings primarily contain country-themed restaurants and shops, with a few rides thrown in. At the top end of the lake is Future World, which contains most of the park’s rides, include Spaceship Earth housed within Epcot’s iconic metallic globe. Prime attractions: the ride Soarin’ is very popular. It simulates a flight around the globe, across savannahs and mountain ranges. Test Track also attracts large numbers. This involves the simulation of testing procedures that cars go through, ending in a fast drive around a track. Why it’s good for the whole family: The Future World section of Epcot will appeal to kids with its numerous rides and hands-on experiences. Younger kids will enjoy rides like Soarin’ and older kids can choose to go on more intense rides like Mission: Space and Test Track. If the kids need a break from the rides, Innoventions has lots of fun games and interactive exhibits for young inquisitive minds. Kids should also love exploring different countries in the World Showcase, but this can be made more exciting by looking out for the Kidcot Fun Spots where kids can collect stamps and create souvenirs. Mum and Dad will probably appreciate the lack of rides in the World Showcase and the chance to take a stroll and a browse while enjoying a tasty margarita. Location and getting there: Epcot is located within the Walt Disney World Resort, which is located in south-west Orlando. From Orlando International Airport, take the OIA South Exit to Osceola Parkway West (exit 3) to Walt Disney World Exits. Complimentary transport to and from and between the parks is on offer to customers staying at certain Walt Disney World hotels. Epcot and Magic Kingdom are connected by the Monorail. Make sure you use your FastPass+ for Test Track as the queue can be very long for this attraction. Try to stay until 9pm when the IllumiNations: Reflections of Earth fireworks display begins – you will be glad you did. Sit-down restaurants get very busy at Epcot so make sure you have made dinner reservations beforehand. If you choose to dine at the Biergarten in ‘Germany’ be aware that you will likely be seated with other people at the same table, which could prove to be a bit awkward. 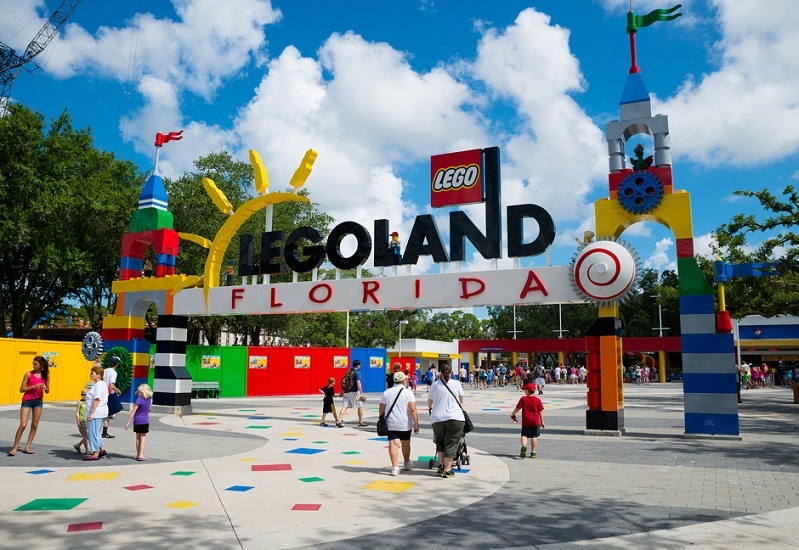 What it’s like: Legoland is the most recently built theme park in Orlando. Well, it’s not technically in Orlando, but Winter Haven, 45 minutes from Orlando. This park has Lego-themed rides and shows, as well as Lego displays. Legoland also features a waterpark, open for part of the year. This park is pitched at children aged 5 – 12 years of age. Prime attractions: Popular attractions include the Ford Driving School, which lets kids drive around in small cars, the Dragon Coaster, and Miniland USA, which shows different cities across the USA built out of Lego bricks. Legoland sells an unusual snack that many visitors rave about – granny’s warm apple fries dusted with cinnamon and sugar and served with whipped cream. Why it’s good for the whole family: Legoland is really great for kids under 12 as it is designed especially for them. There are loads of rides that appeal to kids, such as Coastersaurus and Ford Driving School. There are activities to take part in, like the Mindstorm Robotic Challenge that allows kids to create computerized robots – great for older kids especially. Smaller kids are catered for well, with a Ford Jr Driving School and a Duplo play area. Mum and Dad will like the Cypress Gardens area with its botanical gardens, retained from the Cypress Gardens Park originally in the Legoland location. If any members of the family are, or have been, Lego fans, they will love spending time in Legoland, no matter their age. Location and getting there: To get to Legoland from Orlando, take the I-4 West to exit 55 then turn right off US Highway 27 at State Road 540/ Cypress Gardens Boulevard. You will find the park after four miles on the left. Or, you can reserve a place on a shuttle bus that leaves from I-Drive 360, 8401 International Drive in Orlando at 9am. The cost is $5 for a round trip (returning at park closing). From Orlando International Airport, take the FL-417 Toll S in Meadow Woods from Jeff Fuqua Boulevard, then continue on Fl-417 Toll S. Take US-27 S to FL-540 W/Cypress Gardens Boulevard and turn right onto FL-540 W/Cypress Gardens Boulevard. If you stay at one of the resort hotels you can enter the park earlier in the morning. It is cheaper to buy your park ticket online than to buy them once you arrive at the park. A number of the water rides will get you wet, so bring your own poncho to avoid forking out for one in the park. A cool thing for kids to do is to trade their mini-figures for those carried around by staff members. What it’s like: Disney Hollywood Studios is a park filled with attractions inspired by the Hollywood film industry, with rides like The Great Movie Ride celebrating the best in film. Then there are attractions based on big movie franchises, such as Frozen and Star Wars. The landscape consists of two 1930s-style streets – Hollywood Boulevard and Sunset Boulevard and then a central area dominated by Echo Lake. Hollywood Studios feels smaller than other Disney parks and could be explored in a single day. Prime attractions: Hollywood Studios’ most thrilling rides are its most popular. These are the Rock ’n’ Roller Coaster and The Twilight Zone Tower of Terror. The Toy Story Midway Mania ride also draws the crowds. Hollywood Studios has excellent themed restaurants, such as the 50’s Prime Time Café which shows sitcoms from the 50s, and the Sci-Fi Dine-In where your table is within a convertible car facing a screen showing some rather odd but entertaining clips from back in the day. Why it’s good for the whole family: This park feels more grown up than other Disney parks, given the theme it portrays. This doesn’t mean that small kids won’t enjoy it, however. There are a number of shows catering for little ones, including Muppet Vision 3-D, For the First Time in Forever: a “Frozen” Sing-Along Celebration and Disney Junior - Live on Stage! There aren’t that many kid-friendly rides, though. Rock ‘n’ Roller Coaster and Tower of Terror are only for older kids who don’t mind thrill rides. Hollywood Studios is the perfect park to enjoy a family meal together – head to the 50s Prime Time Café to get a telling off for not eating your vegetables (!) or to Hollywood & Vine for character dining. Location and getting there: Hollywood Studios is within the Walt Disney World Resort, in south-west Orlando. From Orlando International Airport, take the OIA South Exit to Osceola Parkway West (exit 3) to Walt Disney World Exits. Complimentary transport to and from and between the parks is on offer to customers staying at certain Walt Disney World hotels. Try to visit on a day the Fantasmic! show is on – a musical spectacular that uses pyrotechnics and water projections. If you purchase the Fantasmic Dining Package you get priority seating for the show so can avoid waiting in line for ages – something to consider since you will need to eat at some point anyway! Make sure you FastPass+ the most popular rides – Rock ‘n’ Roller Coaster, Tower of Terror, Toy Story Midway Mania and the Great Movie Ride (this has surprisingly long standard queues). What it’s like: when you enter Discovery Cove you will feel like you have arrived in the Caribbean. This beautifully landscaped park is designed to create the feeling of a tropical paradise. At this park you can lounge by the water, take a swim, meet animals on land and water, go snorkelling and even swimming with dolphins. It is an all-inclusive park that provides food and drinks throughout the day, which is reflected in the price. Prime attractions: this water park does not have lots of slides or rides; it’s main attractions are getting to swim with dolphins, going snorkelling, meandering along the lazy river and swimming right up close to sharks, with only a sheet of glass separating you! Why it’s good for the whole family: Discovery Cove will provide an unforgettable family holiday experience that you will think fondly of for years to come. It is best to go to Discovery Cove when kids are over the age of 6. This means they will be able to participate in things like swimming with dolphins. The whole family can get changed into their wetsuits ready for a day like no other. The package includes a commemorative photo for you to take home. When not doing cool things like meeting dolphins, the family can relax together in a private cabana. Mum and dad can have a drink and enjoy the peace and quiet away from the other, much busier, parks in Orlando. Location and getting there: Discovery Cove is located between Universal and Walt Disney World in Orlando. To reach Discovery Cove from downtown Orlando, take the I-4 West to exit 72 (Beachline Expressway). On the Beachline, take the first exit and make a left onto International Drive. Then make a right onto Central Florida Parkway at the third traffic light. Discovery Cove is on the left hand side of the Parkway. Discovery Cove is adjacent to SeaWorld and Aquatica. It’s a very good idea to get to the park early, before you’ve had breakfast, so that you can get your breakfast there as part of the all-inclusive price. The park only allows 1,300 visitors a day, so you won’t have to contend with the same crowds you find in other Orlando theme parks. This also means you need to make reservations for your visit. If you book a ticket to Discovery Cove you will also receive access to SeaWorld and Aquatica for 14 days included in the price. What it’s like: The focus in SeaWorld is not primarily on the rides it offers, but on the live shows visitors can attend. Shows include a killer whale display, leaping dolphins and a sea lion comedy show. You can pay for interactive experiences with the animals, allowing you to touch a dolphin or stroke a penguin. There are also a number of rides to enjoy, although fewer than in other Orlando theme parks. When not on a ride or at a show, you can take in the many animal exhibits. Prime attractions: The top-rated shows are Blue Horizons involving dolphins (soon to be replaced by Dolphin Days), the killer-whale show, One Ocean, and Pets Ahoy!, featuring a host of well-trained but less exotic animals. Top rides include the roller coasters Kraken and Manta and the park’s new dark ride, Antarctica: Empire of the Penguin. Why it’s good for the whole family: Families can have some amazing experiences together, like meeting dolphins and penguins, and get a souvenir photo taken to mark the occasion. Because there are so many shows and exhibits to see, families can stay together for most of the day, instead of splitting up constantly in to groups of who wants to go on roller coasters and who doesn’t. There are some rides to enjoy but this will not be the overall focus of the visit. This non-ride emphasis means SeaWorld really suits all ages, from toddlers to grandparents. There will be fewer thrill-rides to contend with and less time queueing for rides, too. Families can purchase the Family Fun Tour, which offers front-of-the line access to the children’s rides and animal feeding, plus reserved seats at the killer whale show. Location and getting there: SeaWorld is located between Universal and Walt Disney World in Orlando. From downtown Orlando, take the I-4 West to exit 72 (Beachline Expressway). On the Beachline, take the first exit and make a left onto International Drive. At the second traffic light, turn right onto Central Florida Parkway. SeaWorld’s entrance is on the right hand side of the Parkway. If you book one of SeaWorld’s seven partner hotels in Orlando and book through the SeaWorld website to one of these websites, you will receive benefits such as early park access on certain days and free transport to the park. If you are also interested in experiencing Discovery Cove, purchasing a ticket for Discovery Cove will also grant you access to SeaWorld for 14 days. Be aware that you will almost definitely get wet in the ‘splash zone’ seats in the SeaWorld theatre! Gatorland is an alligator-themed fun park pitched as an excellent way to spend half a day in Orlando. This park is not about rides but about fun interactive activities with the park animals. There are thousands of alligators and crocodiles to view, as well as a petting zoo and an aviary. Visitors can get involved by feeding or petting the animals, or just watching the keepers at work. Gatorland is Orlando’s oldest existing theme park, having been established in 1949. Prime attractions: The park’s title attraction has got to be the Screamin’ Gator Zip Line. This 2-hour experience costs $69.99 and must be booked in advance. The price, which includes entry to the park, is well worth it as you ‘fly’ for 1200 ft. over the park, including over the alligator enclosure! For just $10 you can enjoy Adventure Hour, which gives you a tour of the Alligator Breeding Marsh and allows you to get within a few feet of the alligators. And don’t forget to watch the Gator Wrestlin’ Show! Why it’s good for the whole family: The whole family can get interactive at this park – as much or as little as you want. If you just want to observe from afar, that’s fine, as you only need spend $26 to enter the park. If you spend a bit more, however, you can get really close to the alligators and have something amazing to tell friends and family when you get back home. Families can enjoy wandering round the exhibits together, or watching the shows that are laid on. Kids will learn a lot about the animals from the very knowledgeable rangers. If they get tired of looking at the animals, small kids can enjoy the playground and splash park or take the Gatorland Express Train. Gatorland is a good place for the whole family to get a break from the busy ride-filled parks in the rest of Orlando and enjoy some time with nature instead. Location and getting there: Gatorland can be found in south Orlando, on Highway 441, just 20 minutes from the Walt Disney World Resort. If travelling from one of the Disney hotels, take the Osceola Parkway towards the turnpike, then take a left onto Orange Blossom Train (SR 441). After one mile travelling north, you will find Gatorland on the right-hand side. This park is very affordable compared to other parks, at just $26 entry. If you want to take part in certain experiences, however, you will need to pay extra. You should plan your route according to when the shows start so you don’t waste time walking back and forth across the park. Watch out for greedy birds when feeding the alligators – they will swoop down and steal the food! Thinking about a sports holiday next? Check out our guide to the best sporting holiday destinations. Or perhaps you are planning a shopping trip abroad? Take a look at our tips to help you make the most of your shopping trip. Deciding what to take to college or university can seem daunting when faced with an empty suitcase or a pile of cardboard boxes. If this is your freshman/first year, you won’t really know what to expect from college/ university so won’t know exactly what you will need to take with you. Thoughts of being away home may tempt you to pack too much as you begin to realise there is really nothing you can live without. At Send My Bag we have been there, done that and are here to help you with our university and college packing checklist, which will help you identify the most important items to pack.